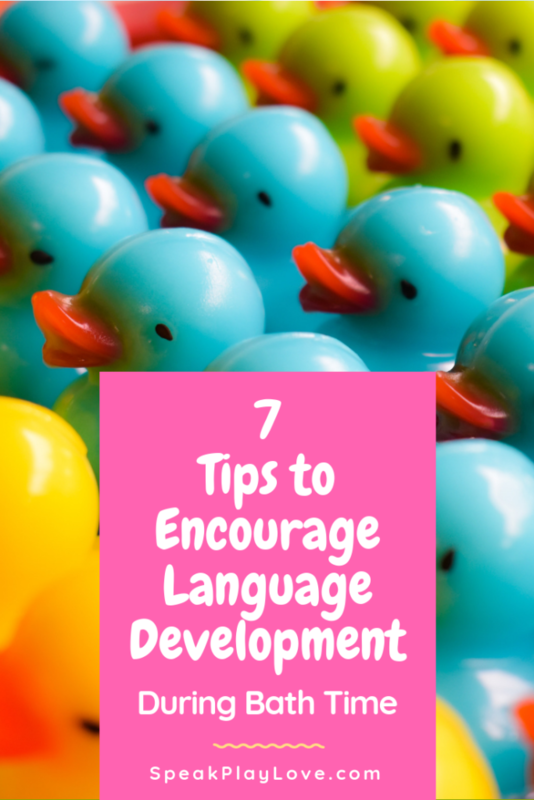 7 Tips to Encourage Language Development During Bath Time | Speak. Play. Love. Toddlers and preschoolers take baths A LOT! 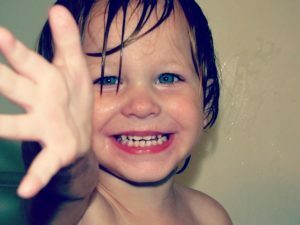 Heck, I throw my toddler in the tub sometimes when she’s still clean – just so she can play! 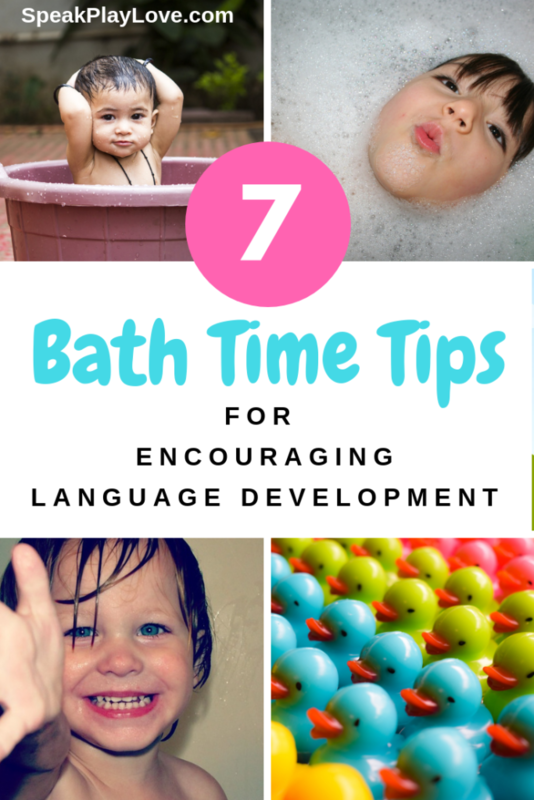 If you have a child that enjoys bath time, it’s a great opportunity to work on communication and language development. Try putting your child in the bathtub but “forgetting” to put water in the tub. And then “forget” to put in the toys! Act totally confused until your child uses some form of communication to tell you what they need. For a child that is saying single words, that might be saying something as simple as “on” or “wawa” for water. For a child that is talking a bit more, you might hold out for a whole sentence. If he only says, “on” then try turning on the light or the sink faucet. Get silly with it so he has to try to explain and clarify using a few more words! For a child who is a very early communicator (perhaps a special needs child that is not talking or communicating much), you might try to get eye contact and/or a point/gesture at the toys or faucet. The idea is to push for a little more communication than you would get normally but also to avoid frustration. This is great for pre-talkers and beginning talkers because you are filling up their ‘bucket’ with vocabulary that they will use later. You have their full attention when they are in the tub; plus, routine and repetition can be very comforting for small children. 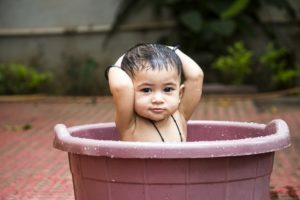 Every time you give your child a bath, work your way through the washing routine the same, soaping up the body parts in the same order each time, then rinsing off the body parts in the same order. Narrate what you are doing in a simple way. For example: “Soap on legs; soap on arms, soap on neck” etc. When you narrate what you are doing, that is called self-talk. You can read more about self-talk here. Once you’ve been using a verbal routine for a while and your child is starting to talk a little, try stopping short to see if he will finish your sentence. 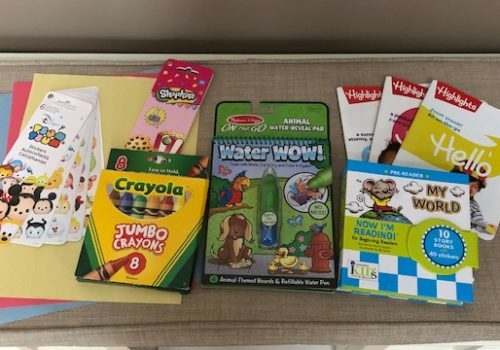 WAIT 5-10 seconds with an excited, expectant look on your face to see if your child will say something – it might be “soap” it might be a body part or it might be sounds that you’re not sure what they mean, but celebrate! Any attempt at talking is a step in the right direction! We have these foam bath letters that are fun to stick on the side of the tub and tiles when they are wet. 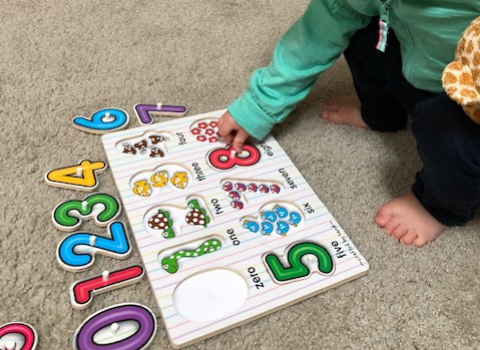 They can be used to teach letter sounds, just by saying the sounds together as your little one sticks them on. Sylvie is starting to enjoy when she puts a few letters together and I sound out the ‘silly’ word. I also help her spell her name, since name recognition is a great early literacy skill! Bath time is one of the best times to learn body parts! Perhaps you already established a verbal routine of narrating how you wash and now your child is ready for something a bit more interactive. For pre-talkers: See if she can point to a body part you name. You can say, “Where’s your tummy?” If she’s not sure after a few seconds, you can point to her tummy or guide her to point. For an extra challenge: Once she’s mastered all the basic body parts (head, tummy, legs, back, etc. ), start on some of the more advanced ones like forehead, elbow, wrist, ankles, etc.! 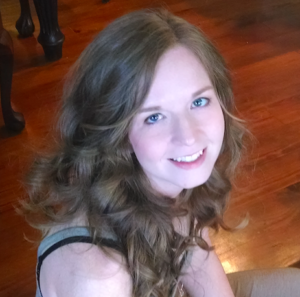 You can also work on body parts when getting dressed, with lotion (read below), or with Mr. Potato Head. Read more about using Mr. Potato Head here. Does anyone else have a little one that loves lotion? The sensory aspect of using lotion of it is great – texture, smell, and massage. Um, okay – now I want a massage! 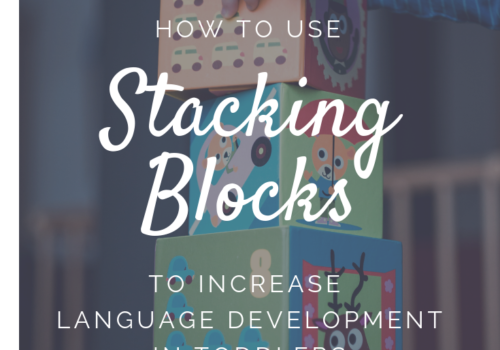 It’s a great way to keep working on body parts, or to ask for “more,” or just to enjoy as a calming activity together. 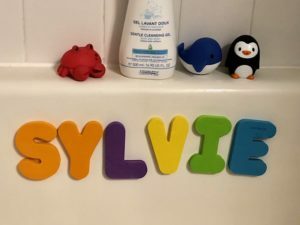 Sylvie needs some new bath toys. What are your favorite bath toys for toddlers and preschoolers? Does your child love lotion too? 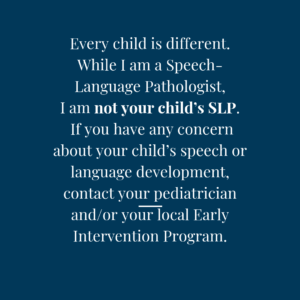 I have been doing these activities with my son…he is speech delayed. Love these ideas!